Captain Jay Miller owns and operates the Outer Limits. From the time he could walk, he fished the coastal waters of southwest Florida off his hometown of Englewood Beach. He honed his charter and commercial fishing skills -- from live baiting, to trolling, to bottom fishing, and sight fishing -- while fishing the Gulf of Mexico for a variety of species. Captain Miller has logged thousands of days on the ocean. 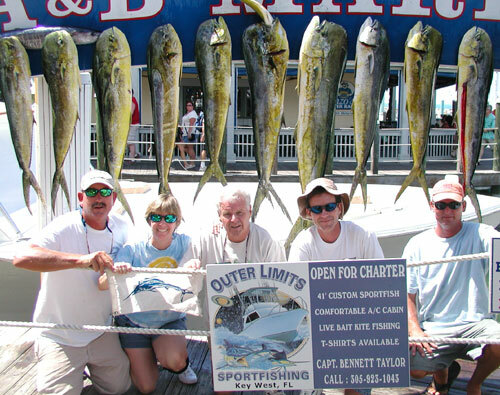 After his move to Key West in 2001, Captain Miller worked full time on many different sport fishing boats out of the famed Charterboat Row, learning from as many Captains as he could. He found each of them to have a different perspective, and something to teach him. Captain Miller obtained his 100 ton Coast Guard issued Captains license in 2004. As a Mate/Captain he spent 4 years working with Captain Bennett Taylor, who previously owned and operated the Outer Limits. He spent 2 years as captain of a 28ft. Whitewater where his skills of light tackle fishing were perfected. Capatin Miller has worked on such boats as the TripleTime, the Linda D, the Patriot, the Snake Oil, the Reel Appeal, the Outer Limits, and countless others. From Flats skiffs, to Offshore center consoles, to 65ft private Sportfishing yachts, he has run them all. 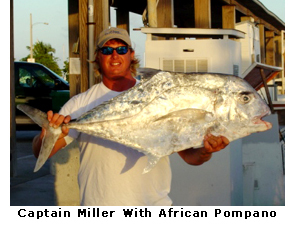 This experience has helped Captain Miller become very successful in the charter fishing industry. With a delightful smile and a charismatic personality Captain Miller has many clients that fish more than 20 times a year with him. During his fishing career Captain Miller has fished many tournaments. His favorites are tournaments that target Kingfish, Sailfish, Swordfish, Marlin, and Dolphin. He took top honors in the 2010 Dolphin Masters Invitational by winning across the board with largest Dolphin of 60lbs. and highest aggregate weight of 97lbs. He also took largest Blue Marlin honors alongside Capt. Billy Wickers in the 2007 Drambuie Key West Marlin Tournament. © Copyright 20012, All Rights Reserved.